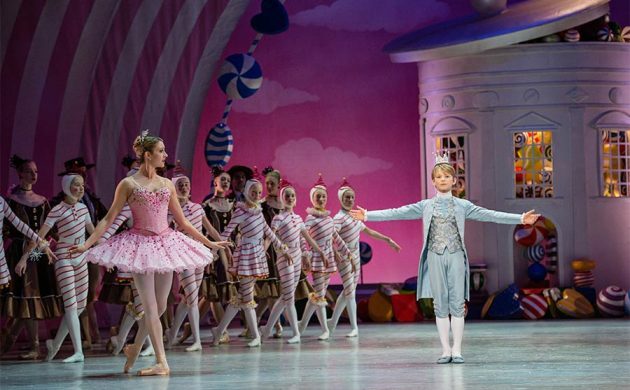 Pyotr Tchaikovsky’s melodious notes are echoing throughout the Royal Danish Ballet theatre as ‘The Nutcracker’ takes to the stage again this holiday season. While an elaborate display of enchanting sets and dazzling costumes is alone incentive enough to attend, if you don’t enjoy watching a handful of adorably talented young performers waltz about with sincere joy pasted across their pointed little tendús and fifth-position borre arms, then you better start researching the possibility you’re descended from Ebenezer Scrooge. Young Clara (or in the Danish case, Marie) is played by the charming Selma Hertel, who is accompanied by her fellow young prince, Marcus Steenberg. As the story goes, during a grand ball Marie unwraps her gift from Herr Drosselmeier and is delighted to find a perfect Nutcracker gazing back at her. After her dear Nutcracker suffers limb damage courtesy of a pesky haggle of boys, Drosselmeier heals his wooden shoulder and Marie falls asleep cuddling her precious Nutcracker. In her dreams, Marie magically shrinks to toy-size and anxiously witnesses a dramatic sword fight between dutiful soldiers and thieving mice (whose king is befallen by the Nutcracker, which has come to life in Marie’s defence). The corps de ballet then twirl in long white tutus during a mesmerising symphony to the Waltz of the Snowflakes, a personal favourite. After the intermission the lead Sugar Plum Fairy (Caroline Baldwin) holds court to worldly company as dancing visitors from near and far shower the audience with their skills. As expected, Mother Ginger reveals the dancing children from under her billowing skirts after such guests as gumdrop Holly Jean Dorger and Candy Cane conductor Ida Praetorius parade the stage. Baldwin shines alongside a classical cavalier gentleman (Gregory Dean) in a faultless Pas de Deux finish. Considering the perpetuated gender and ethnically-problematic stereotypical tropes (namely the characterised Spanish, Arabic, and Asian roles as visiting performers, and the ‘Prince-saving-Princess’ narrative), ‘The Nutcracker’ manages to highlight exceptional choreographic measures executed by equally brilliant dancers. The revered tunes of this ballet will continue to grace the theatre’s halls for many holiday seasons to come. Performance Review: Feel the full force of the Crazy Christmas Cabaret!